Krispy Kreme's Cinnamon Swirl Donut features a yeast ring donut rolled in cinnamon-sugar and topped with a swirl of cream cheese icing and cinnamon roll filling. They typically go for about $1 (varying with location) but I received this courtesy of Krispy Kreme. 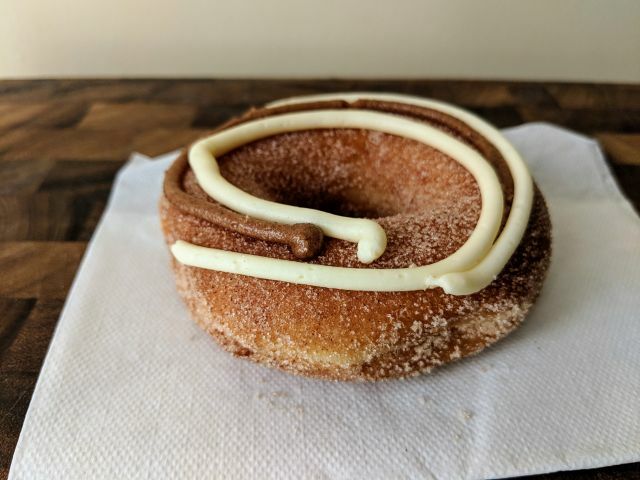 The Cinnamon Swirl Donut is basically the chain's Cinnamon Sugar Donut topped with some extra cream cheese and cinnamon roll filling. The donut itself has the light, fluffy texture that Krispy Kreme is known for. Between the cinnamon-sugar and the swirled toppings, the donut is sweet but not overly so. The cinnamon-sugar adds an evenly spread, slight crunchiness but also makes it a bit harder for the toppings to stick onto the donut as the granules get in the way. I wouldn't recommend walking around eating this one as the toppings/swirls tend to fall off. The cream cheese gives the donut a creamy richness and a slight tang, while the cinnamon roll filling ups the cinnamon flavor. 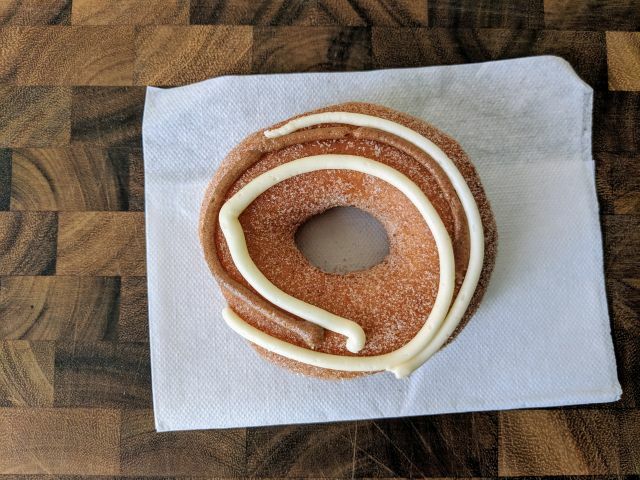 Unlike an iced or frosted donut, which can get a little messy when warmed, the Cinnamon Swirl Donut heats up rather nicely in the microwave (around 7 seconds seems to be the way to go). Overall, Krispy Kreme's Cinnamon Swirl Donut was very enjoyable and presents a varied combination of crunchiness and softness as well as richness and sweetness.